Going to the movies with your baby…now THAT is an adventure! 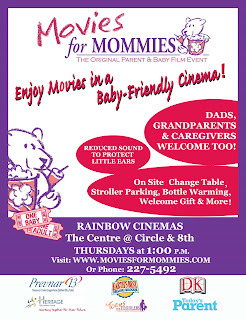 Movies for Mommies at Rainbow Cinemas in The Centre at Circle and 8th provides a perfect reason to get out of the house. A different movie is shown each Thursday at 1 p.m. If it is your first time to Movies for Mommies, you will want to come 15 minutes in advance to meet your gracious hostess Lisa and get your goodie bag! (Psst...Earth’s Best is a national sponsor and often provides jars of organic baby food.) Even if it isn’t your first time, you will want to come a little early to make sure you don’t miss out on the door prizes. Park your stroller up front, find a seat and enjoy a guilt-free cinematic indulgence. If your baby happens to cry, you will be surrounded by sympathetic ears. However, most babies seem to settle down once the lights are out. When I would nurse my baby during the opening credits, he usually would nap through the entire movie. If your baby requires a diaper change, a change table is available at the back of the room. They often have diaper samples, wipes and a bottle warmer at the back as well. Movies for Mommies welcomes dads, grandparents, caregivers and friends without kids. While the recommended age for “little film critics” is 0 to 18 months, no one will be turned away. Just keep in mind most movies that they screen are for adult audiences. Admission to Movies for Mommies will now be $6.50 (instead of $6.00). You still get every 7th movie free and weekly giveaways, door prizes and everything else MFM has to offer. Hi are 3 year olds aloowed also or just babies? While the recommended age is 0 to 18 months, no one will be turned away. Just keep in mind most movies that they screen are for adult audiences, so it might not be appropriate for an older child to watch. You might check out Toons for Toddlers for your 3-year-old. Hi, what are the dates and time for this?